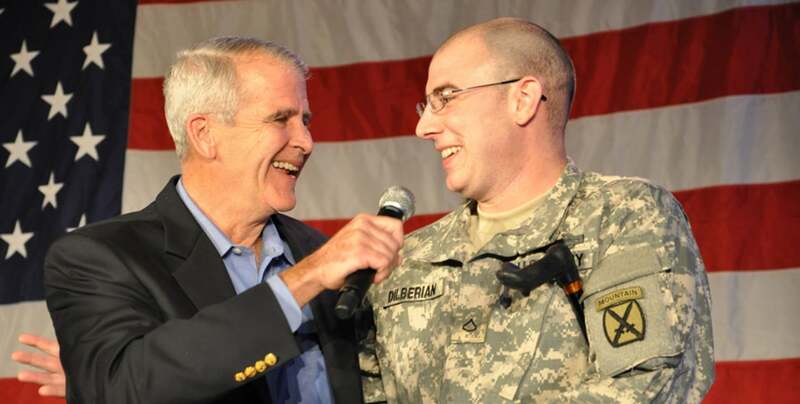 In honor of Ollie North’s 75th birthday, some loyal friends of Freedom Alliance have stepped forward to issue a $75,000 Matching Gift Challenge. These generous friends told me if we can raise $75,000 by October 27th to help wounded combat troops, they will match that amount with another $75,000! That means we could put a total of $150,000 to work right away providing urgently-needed care and support for our wounded heroes and their families IF we meet this Matching Gift Challenge in time. Meeting this Challenge would mean so much to the brave service members, wounded troops, and military families Freedom Alliance serves every single day. We must never abandon our heroes in their time of need, and we must never forget their sacrifices in defense of our liberty, safety, and freedom. Supporting more of our wounded troops and their families is what would truly make Ollie’s 75th birthday special. Most people know Ollie is a Marine decorated for his courage in battle during the Vietnam War. They know he served on President Ronald Reagan’s national security team. And they’ve seen his “War Stories” TV show on Fox News. He is a true American hero. But if you talk to Ollie in person, you know “it’s not about him.” You’re immediately struck by how deeply he cares about the safety and well-being of every person who has ever worn the uniform. That’s why he founded Freedom Alliance in 1990. Since then, Freedom Alliance has led the charge in “giving back” to the men and women in our Armed Forces who give so much for us. From the Middle East, to Africa, to Asia, our men and women in uniform are increasingly being called on to put themselves in harm’s way to defend our freedom. And when they return home with life-changing injuries, we need to make sure these heroes get the care they deserve — and let them know their sacrifices aren’t forgotten. It’s absolutely critical that we successfully meet this $75,000 Matching Gift Challenge. Heal military marriages and family relationships through the retreats and support programs Freedom Alliance provides. Our troops rely on the lifesaving support made possible by Freedom Alliance donors. With a successful Challenge, we’ll also be able to help more of the sons and daughters of our wounded and fallen warriors through our scholarship fund. Each of our scholarship recipients have lost a parent in service or suffered grievous injuries serving our country. So far this year, we’ve helped more than 350 of these young men and women. We also help support these families through outreach projects such as our Annual Retreat for Scholarship recipients, birthday cards, care packages at exam time, graduation gifts, and much more. We can’t turn our backs and let them down after the sacrifice their parents made for us. With every donation to Freedom Alliance made before October 27th going twice as far in supporting American combat troops overseas … caring for wounded veterans here at home … and assisting the military, now is the perfect time to show our heroes they’re not forgotten.